Asana is a work management tool designed to help teams know who’s doing what by when. Using the web or mobile apps, teams can communicate, collaborate, and organize all of their work. 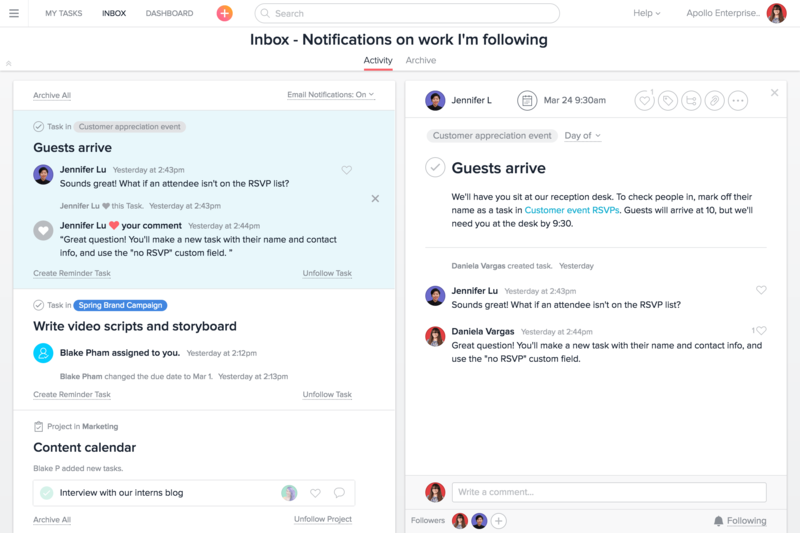 Designed to streamline team task and project management, Asana provides a single place where you can track, manage, and comment on shared projects and tasks, get automatic updates on tasks that matter to you (without another email notification), set due dates, track project progress, collaborate with teammates, and much more. You can organize your projects in a list, calendar, or kanban board style view. It was one of the first completely cloud-based project management solutions and is certainly still among the most popular platforms on the market today. It is completely free to try and is always free to teams with up to 15 users. The premium version is priced on a sliding scale. It costs $9.99 per user per month when billed annually and $11.99. Teams of 15 or fewer qualify for a small team discount. Asana Premium features include private projects and teams, custom templates, unlimited guest accounts, a dedicated customer support manager, task dependencies, custom fields, comment only projects, additional security features, and an unlimited number of dashboards. Asana is used by teams across all industries. Some of the companies using Asana include CBS, Dropbox, Uber, Pinterest, Airbnb, and many more. If you’d like to compare Asana with other project management tools, check out our Product Selection Tool. Learn everything you need to know about Asana. Our experts will reach out to you shortly.